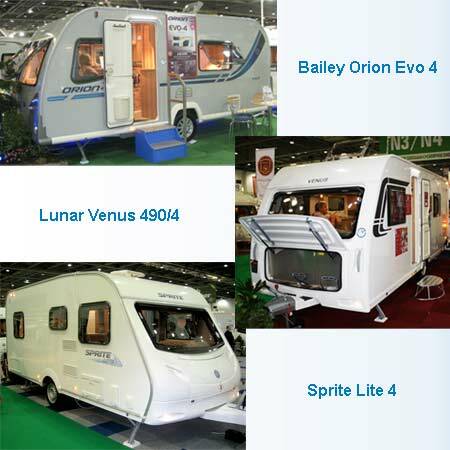 If you’re weight watching then here are three lightweight 2012 caravans to consider; the new Orion Evo 4 by Bailey the new Venus 490/4 by Lunar and the Sprite Lite 4. All of them are four berth caravans with fixed double beds, what we call the lazy man’s two berth, with parallel seating at the front and offside kitchens. To look at casually, you’d think there was little difference except in aesthetics to seperate these three models. But look closer and you’ll see why the Sprite Lite 4 wins in terms of weight. There’s neither chest of drawers nor locker over the one-piece front window but there is a neat little table. It doesn’t have an oven either but does have a two-burner gas hob; a slow cooker would complement this. The space heater uses gas for convection heat, there are no blown air ducts to toast your toes on the uncarpeted floor. It lacks a shower too, but does have a Thetford loo. 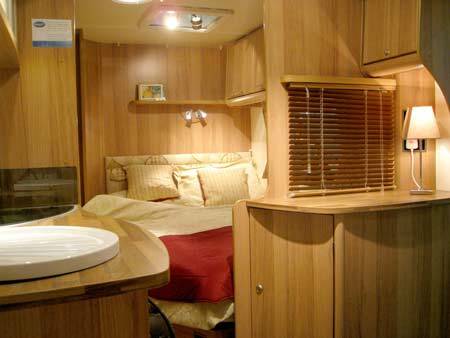 However, despite the lack of features it probably fits the bill perfectly if you want a step up from camping. 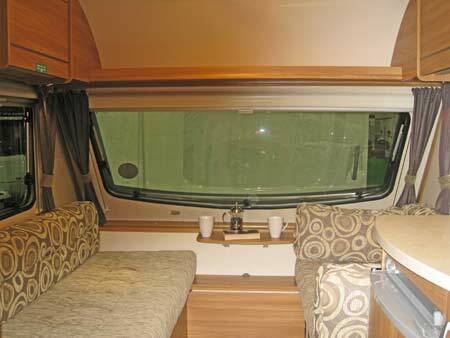 Although you may want to add extra comfort to use it all year round as it only has a Grade II classification for thermal insulation and heating rather than Grade III as found on higher spec caravans. Bear in mind also this caravan is over £2000 less to buy than the other two featured here. The Bailey Orion Evo 4 is a new light weight concept. Again no chest of drawers at the front, a small table is fitted but there is an overhead locker over the one-piece front window. The kitchen has a two-burner gas hob with an electric hotplate which has a neat split lid, divided ⅓ and ⅔, and a 900W combination oven/grill/microwave; but luxury or essential? The end shower room has full facilities and a quirky retro look. Its weight loss programme is largely due to striping out the full fat dual power supply, to a single source, namely electric, including a plinth mounted space heater. It does have drop in carpets. With no battery either, that has helped reduce the weight even further. It does have Grade III classification for thermal insulation and efficiency. Venus, like its competitors, is also an entry level product aimed at couples. The use of the Whale under floor mounted space heater and rapid water heater, both of which are lighter than competitors’ products, is an obvious benefit and it too profits from Grade III classification for thermal insulation and efficiency. A carpet runner takes the chill of the floor and the kitchen does have a three burner hob and a Thetford Combi oven and grill. The end washroom has full facilities. With all models you need to look at security features; all have CRIS identity etched on windows and security data chips; AL-KO AKS and AL-KO Secure receiver are standard on Evo but options on Venus and Sprite. You would of course still have to purchase the lock for the AL-KO Secure before qualifying for some money off caravan insurance! With the price of fuel eating up our pounds, environmental considerations and the weight of new cars reducing, are these your slimline tonic? 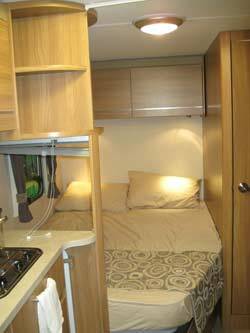 The Sprite Lite is a good buy for a first time caravanner, maybe younger couple, who want only a bit of comfort; the Bailey Orion Evo will appeal to those want a high level of comfort and who never rally or visit sites without mains electric hook up; it’s ideal for a couple with a progressive forward thinking outlook to caravans. 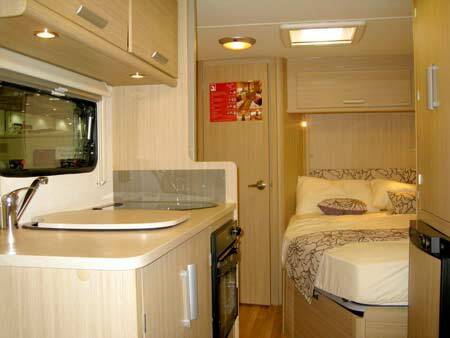 Venus will suit the first time buyer, or a returning to caravanning couple, the traditionalist who doesn’t mind a touch of contemporary design. 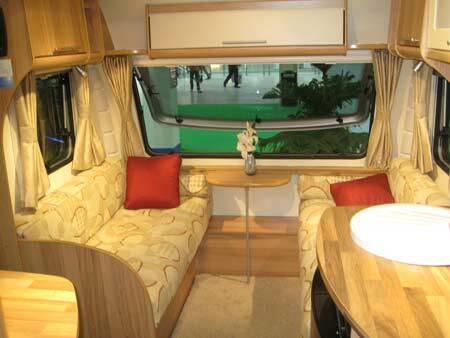 *Caravan insurance cost based on Sprite Lite 4 £10,455 **Bailey Orion Evo 4 £12, 695 ***Venus 490/4 £12,495. Fitted with hitchlock and wheelclamp. Kept on drive at HX4 0BE. Caravanners over 30 years old, claim free for 3 years and a member of a caravanning club. Quote includes 10% online discount and 6% Insurance Premium Tax and is correct as of 16.05.12. Does Lunar still preduce the Venus 490/4. I have been looking but no luck so far, and I think at 80 years old it would be perfect for hubby and me. Glad you’re enjoying it Marion. We bought the Venus 500/4, the one with twin beds, and it is excellent, and although they are ‘beds’ we still sit on them in the evening and watch the TV. This is an excellent little caravan, the price was right for us, and so far we have been in Portugal for a month, and it has worked brilliantly. Wish this van had been around when we wasted a lot of money buying the Bailey Olympus is 2011. 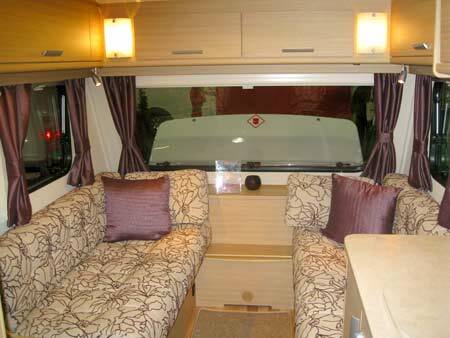 I want to buy a new Bailey Evo 4 but I don’t want the fixed bed option enough, I just don’t get what the attraction of the fixed bed option is. I love the idea of a fixed bed & thats exactly why I would buy one – nothing worse than messing around trying to put your bed together after a day long march on the moors! Why did the designers have to design a fixed bed? What a waste of seating area and this alone would put me off purchasing one. why oh why, are these fixed bed. personally i find this a waste of space. it does not take long to put the bed up. lazy mans 2 berth too right! !